Blomqvist took a tough victory in race two at Pau. © FIA. 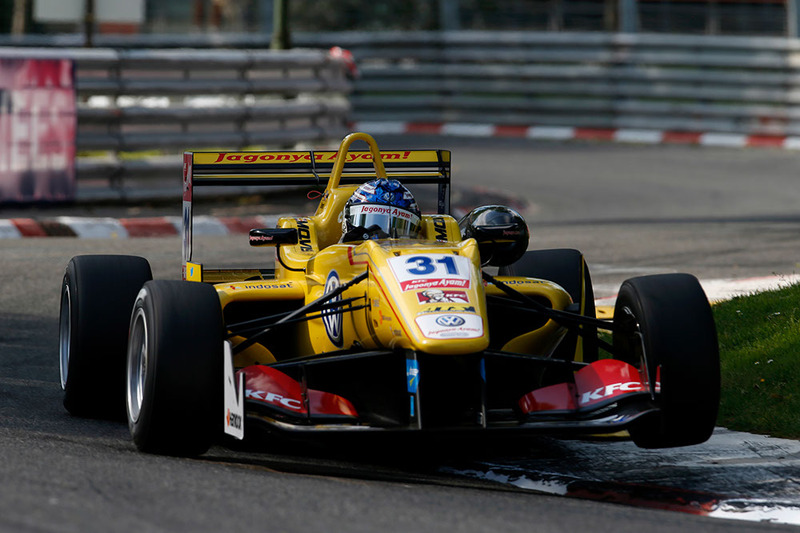 A late move for the lead gave Tom Blomqvist victory in the second FIA European F3 race of the weekend at Pau. In a race peppered with incidents and two safety car periods on the damp Pyrénées streets, Blomqvist (Jagonya Ayam Carlin) ran 4th in the early stages, before taking advantage of race ending mistakes by van Amersfoort’s Max Verstappen and Felix Rosenqvist (Mucke Motorsport). Following a clash with Rosenqvist, Ocon (Prema Powerteam) struggled with damage as the Prema man began to lose over three seconds per lap to the promoted Blomqvist. An accident for Carlin’s Ed Jones brought out the second safety car, bringing Blomqvist to the tail of Ocon and offering the Anglo-Kiwi a shot at the victory. Running back under green for the final two laps, Blomqvist pressed a clearly damaged Esteban Ocon to grab the lead exiting Lycée and take a stunning victory. Ocon maintained the runner-up spot, but was lucky to do so. The Frenchman had faced pressure from Rosenqvist for the first two-thirds of the race, with the pair continuously swapping fastest laps for several tours. The battle came to a head on lap 14, when Ocon – having damaged his right rear slightly when bouncing over kerbs – came under intense attack from Rosenqvist. Launched a final attack from the exit of Virage de la Gare and into Pont Oscar, Ocon ran slightly wide leading the pair to collide, sending the Swede into the barrier. With carnage reigning around him, Jake Dennis (Carlin) held onto to take 3rd place, but could have made it a Carlin 1-2, had the Briton had another lap. On constantly slipping tyres, the rookie was unable to get a good enough run on Ocon during the final tour to make a move, but was delighted with his first Formula 3 podium nonetheless. Antonio Giovinazzi took a welcome 4th place fort Jagonya Ayam Carlin. The Italian came home several seconds clear of Dennis van de Laar (Prema Powerteam), who in turn led a train across the line. In van de Laar’s wake were Mücke-Motorsport pairing Mitch Gilbert (6th) and Lucas Auer (7th), while West-Tec’s Felix Serralles (8th) held close. From last on the grid, Roy Nissany scored two points for Mücke Motorsport; just 1.6s clear of Hector Hurst who registered his first top-level Formula 3 score. Given the conditions, there were accidents aplenty. The race had been started under safety car, but that did not stop T-Sport pairing Spike Goddard and Alexander Toril spinning in unison on lap 8. Four laps later, Verstappen crashed backwards into the barriers in Foch after initially getting it wrong through Parc Beaumont. An astonishingly unrealistic move by Felipe Guimarães took both he and Tatiana Calderon out of the race on lap 15, before Jones’ crash finally neutralised the race. As the race restarted, there was a pile-up in the lower points order, as Nicholas Latifi and Jordan King crashed into each other on the apex at Lycée, while behind them Fuoco avoided the incident, but broke his gearbox as he attempted to reverse away from the incident. John Bryant-Meisner was also caught up in the incident as the wreckage blocked the track, causing the Swede to lose four positions and a handful of points.